Balera 3-Layer Tulle Tutu. A ballet must-have, this traditional, eight-inch tutu is constructed of three-layers of tulle and features a comfortable matte nylon/spandex waistband. Available in several colors. Balera Camisole Bra Top. A camisole bra top with adjustable straps and a 1" elastic hem for support. Full front liner. Imported. Available in Child and Adult Sizes in several colors. Balera 3-Layer Tulle Tutu. A ballet must-have, this traditional, eight-inch tutu is constructed of three-layers of tulle and features a comfortable matte nylon/spandex waistband. Available in several colors. Balera Girls Convertible Dance Tights. Nylon/spandex microfiber convertible tights features a dyed-to-match cotton gusset for cool, dry comfort. Imported. Fits true to size. Available in several colors. Balera Girls Fishnet Dance Tights. Girlc' economy fishnet footed tights. Nylon/spandex microfiber. Dyed-to-match plush elastic waistband. No gusset. Imported. One size fits all. Balera Girls Convertible Dance Tights. Nylon/spandex microfiber convertible tights features a dyed-to-match cotton gusset for cool, dry comfort. Imported. Fits true to size. Available in several colors. Balera Girls Footless Dance Tights. These silky smooth nylon/spandex microfiber tights feature 1" hems at the ankle, soft turned edges and a dyed-to-match cotton gusset for cool, dry comfort. Available in several colors. Balera Kids Bow Accent Skirt. Sweet georgette ballet circle skirt perfect for class or performance. Available in children's sizes only in several colors. Balera Rhinestone Seam Fishnet Tights. Nylon footed fishnet tights with rhinestone back seam. Elastic Waistband. Imported. One size fits all. Balera Romantic Tutu. This sophisticated, Degas-length tutu is constructed of cascading layers of elegant tulle and features a comfortable matte nylon/spandex waistband. Available in several colors. Balera Statement Waist Platter Tutu. This classic ballet tutu features a wide waistband that hits at the natural waist but can fold over, too. Nylon/spandex trunks attached. Available in several colors. Balera Womens Convertible Dance Tights. Nylon/spandex microfiber convertible tights features a dyed-to-match cotton gusset for cool, dry comfort. Imported. Fits true to size. Available in several colors. Balera Womens Footed Dance Tights. Nylon/spandex microfiber convertible tights features a dyed-to-match cotton gusset for cool, dry comfort. Imported. Fits true to size. Available in several colors. Balera Womens Footless Dance Tights. These silky smooth nylon/spandex microfiber tights feature 1" hems at the ankle, soft turned edges and a dyed-to-match cotton gusset for cool, dry comfort. Available in several colors. Balera Womens Pro Fishnet Dance Tights. Ladies' professional quality fishnet footed tights. Sewn-on dyed-to-match plush elastic waistband. Double-padded sole with cotton insole and nylon outsole. No gusset. Imported. Available in tan or black. One size fits all. Bunga Bamboo Gel Knee Pads. 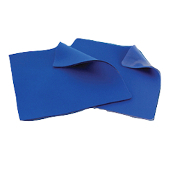 The first gel kneepad designed specifically for dancers and skaters. Constructed of a soft but sturdy bamboo knit fabricand contoured silicone kneepads. Two sizes available. Mondor 16207 Pull-On Dance Skirt Mondor 3519 Racerback Sports Bra Top - Clearance! Mondor 16207 chiffon pull-on skirt with knitted wasitband. The Mondor 3519 Racerback Sports Bra Top has a fully lined front and has a very supportive elastic band. Excellent sports bra for any sport, cheer, dance, gymnastics or skating. Available in Child and Adult Sizes in several colors. Not quite sure what to buy for your special skater? Try a gift certificate! Gift certificates can be used to purchase any item. Mondor 227 Men's Support Dance/Skate Belt. Provides light support and provides coverage under tights, costumes and skate pants. Mondor 310 Footed Womens Dance Tights - Clearance! Mondor 314 Convertible Womens Dance Tights - Clearance! Mondor 310 Footed Womens Dance Tights. These are the ultimate Classic ballet tights. This very soft semi-opaque, 40 denier, footed tight looks great with any leotard. Available in Classic Pink Only. Mondor 314 Convertible Womens Dance Tights are the ultimate Classic ballet tights. This very soft semi-opaque, 40 denier, convertible tight looks great with any leotard. Available in Classic Pink Only.